First line: "I didn't think my day could get any worse until my best friend told me she might be going crazy. Again." 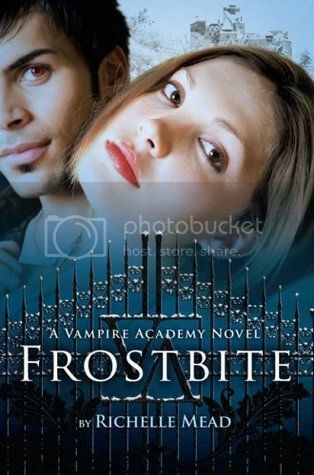 I enjoyed this second installment in the Vampire Academy series. Once again, we return to St. Vladimir's, an exclusive private school for young vampires. Physically weak, Moroi have elemental magic. Half-human, half-vampire dhampirs train to be their bodyguards. Immortal, evil Strigoi are recognizable by their pale skin and red-rimmed eyes. Dangerous attacks by an unusually well-organized group of Strigoi (who are normally lone hunters) have the Moroi vampire nobles in a panic. The students are forced to hole up in a glamorous ski resort over winter break. Tough girl dhampir Rose must sort through her feelings for her forbidden mentor Dimitri, and safe good-boy Mason. Not to mention her unresolved feelings towards her mother, a ruthlessly efficient bodyguard who abandoned Rose to further her own career. Rose's best friend Lissa and her boyfriend Christian are getting more serious, much to Rose's dismay. Rose's one-way psychic link leads to some awkward moments when she can see into her friend's thoughts, including intimate moments with Christian. The first chapter is exposition-city, designed to help readers who've skipped the first in the series. The theme of female-dhampir-as-sluts is again briefly touched upon, but not fully explored. Tired of living under duress, some of the Moroi finally decide they'd like to figure out how to use their elemental magic in battle. What I find hugely curious is the subservience of most of the dhampir. I'd love to see a full-out dhampir rebellion. Just because they're the genetic equivalent of mules is no reason why they have to settle for second best at every turn! Those annoying Moroi deserve to be knocked off their high horses. In the end, Mason sacrifices himself, believing to the last that Rose loves him. Dimitri turns down an intriguing offer of guardianship with an unconventional Moroi woman (Christian's aunt Tasha) I think it would have been so interesting if he had taken the offer. But then again, I'm a sucker for hard choices and unrequited love stories.